I came across this fascinating map showing mobile phone types today – Mobile Devices + Twitter Use. There is another indictment of our failing third level education system described in Digital Marketing Institute says Ireland has ‘unemployable’ marketing graduates. This time it relates to marketing graduates, and their lack of digital marketing skills. The institute’s Ian Dodson said that 100% of marketing jobs now involve digital marketing, but that just 10% of third level graduates have those skills. I think that digital marketing should be a mandatory requirement! “Unfortunately, third level students are coming out, not just with poor digital literacy in Office applications, but with woeful levels of literacy when it comes to using the more modern tools and technologies, like Facebook, LinkedIn and Twitter, to promote and market business,” he added. I often think that academics in Irish universities become lazy, and simply regurgitate the same material despite it often being many years out of date! It seems impossible to spend any time online these days without hearing about Pinterest. It certainly seems to be going from strength to strength, and it is now the third most popular social networking site according to Pinterest is third most popular social site after Facebook and Twitter. I admit that I have not used it yet. I intend to try it, but at the moment I do not really see what the attraction is! Pinterest’s first investor explains this attraction in Pinterest’s First Investor Explains the Secret to the Startup’s Success, but I still do not get it! I think that I should give Pinterest a try! Liam Stacey, a 21 year old student, has been jailed for comments he made on Twitter, according to Student jailed over Muamba comments. I have not seen the exact comments that Liam made, so I cannot comment on whither or not they were racist. However, regardless of their content, I firmly believe that Liam has the right to say whatever he wants (online or otherwise). It is also a sad day for the UK! I am amazed that its judicial system has been reduced to this level of stupidity by policing teenagers’ comments on social networks. 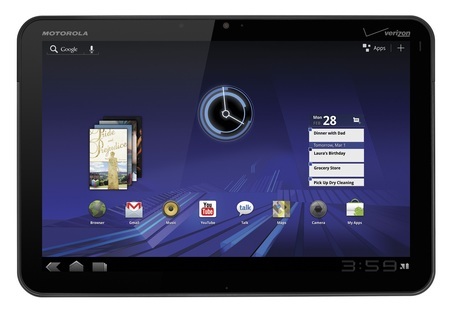 I use Pulse on my Motorola Xoom. I love it, and it is possibly the most used application on my tablet. The combination of Pulse and the tablet has definitely enabled me to become more knowledgeable in everything from current affairs to hobbies! Imagine that I am interested in following feeds that fall into seven categories, for example, Economics, Politics, Sport, Travel, Lifestyle, Technology, and Property. Currently, Pulse allows me to have a maximum of five categories! So inevitably this limitation forces me to mix completely unrelated feeds together :( This looks wrong, and it makes it difficult to find the feeds that I want when they are bunched in with unrelated feeds. The fix to this is very simple – allow an unlimited number of categories! There is plenty of space across the top for more categories! If this space become full, then let the user swipe to move from category to category (just like moving from port to post within a feed)! 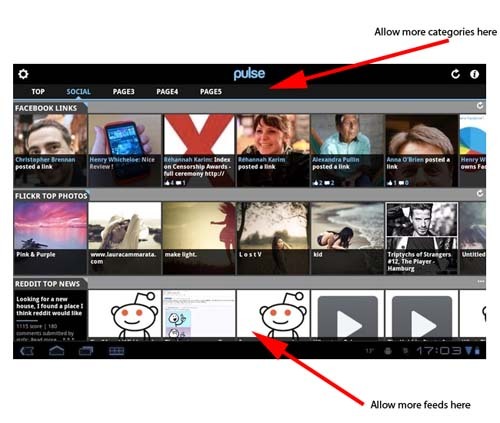 To fix this simply allow an unlimited number of feeds per category! I do not see any technical reason why these limitations exist. My guess is that somebody hard-coded a number into an array somewhere! It is probably worth remembering that these comments are coming from somebody who uses Pulse on an Android tablet with plenty of processor and memory resources, and a really fast WiFi Internet connection. There was lots of talk about Apple‘s announcement of iOS 5 last week. For an overview of the new features read See new features included in iOS 5. Notification Center – This seems like very expected functionality to me! Actually, it is interesting that Apple is playing catch-up to Android in this respect! iMessage – A potential SMS killer? Some think so! See Apple Has Finally Stuck A Dagger Into SMS. I Love It. and Apple surprised iPhone carriers with iMessage. I think that this must have the telcos worried! Reminders – I just think this looks good, at the same time as being functional. Twitter – Interesting that Twitter was chosen ahead of Facebook. Why did Apple choose Twitter over Facebook for iOS 5? gives some insight into this decision. PC Free – Big advantage to me! I hate having devices coupled to a single computer! Finally, Google Android vs. Apple iOS: Handicapping the 2011 death match gives a good comparison of iOS and Android. I read an interesting article about using Twitter while watching television today – see The audience tweets back. I must admit that this is something that I have done, and I found it made mundane programs become very entertaining!